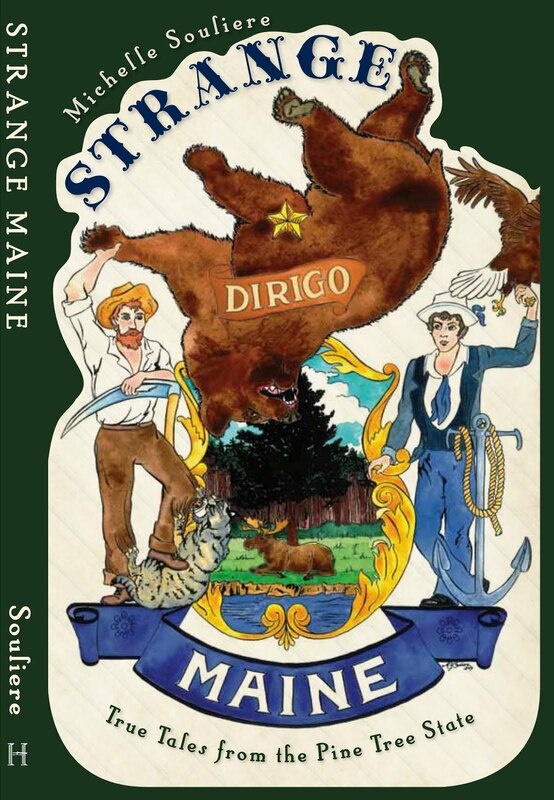 Strange Maine: Flying Moose of Maine! Well before the arrival of the first white settlers, the Abenaquis tribe lived in a village where the Mechatigan and Manosak rivers meet. The Abenaquis tribe would return to this area every year to stock up on food, which was plentiful here thanks to the two rivers and the surrounding forests. According to the legend, Mahanak, the son of the grand chief Metgermett, befriended a young moose that had lost its mother when she tried to protect it from a pack of attacking wolves. When Mahanak found the young moose, it was badly injured and weak and was slowly dying. The two friends became inseparable. One spring day, Mahanak and his friend were returning to the village after a long trek through the Etchemin countryside. They were forced to take a different route because the melting snow had caused the mighty Manosak river to rise. In an effort to avoid a huge rock, the two companions lost their foothold, fell into the raging river and were swept away by a powerful current. Mahanak managed to grab hold of the moose's antlers and climb onto its back. As they were approaching the Devil’s waterfalls, Mahanak implored the spirits of the forest to come to their rescue. The spirits remembered Mahanak’s act of kindness on the day he saved his young friend. The spirits helped the moose descend the falls by keeping its head above the water and saving Mahanak from drowning. Two old hunters, who had witnessed the scene, said that the moose had descended the falls slowly, as though it had wings. The following night, Mahanak had a dream. The spirits of the forest told him that his moose would be leaving him to go to the land of the spirits where it would watch over the inhabitants of the forest. Mahanak then saw his companion nod good-bye and slowly fly away, opening its mighty wings. By sunrise, the moose had disappeared. Very nice. We just got back from camping at Moosehead Lake. Took the family to Rockwood and told them to keep an eye out for moose along the way. They were surprised. 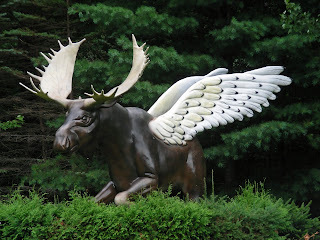 . .
We saw it a few years ago when driving from our cabin on moose head lake to Greenville. Very beautiful and great story! Always thought it was Mr Dutil’s corporate logo, he’s the property owner. Yes, it's the logo for MANAC, a Canadian semi-trailer manufacturing company he founded. You can see the Flying Moose on the mudflaps. Story I know is that when Dutil was a kid he wanted to be rich and his friends said that he would be rich when moose fly.